Vin Santo wines are known to have been made since at least the Middle Ages, and have become a traditional part of Tuscan life. The origins of the name (literally ‘Holy wine’) are disputed, but most agree it comes from the time when these wines were used for Holy Communion. Traditionally made from grapes left to dry so that the grapes’ natural sugars are more concentrated and then pressed to make amber-colored wines with aromas of apricots and orange blossom, with a nutty, raisin-rich palate. 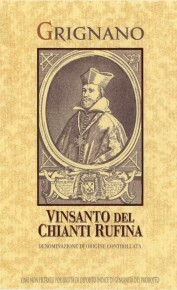 Vin Santo wines are still produced widely today (there are similar wines made in other Italian regions too) and were finally recognized under DOC law in 1997. The late arrival of the various vin santo DOCs was not due to any particular lack of quality, but because of the vast range of styles in which vin santo is made. Although vin santo is generally classed as a dessert wine, its sweetness levels vary. Most are made sweet (amabile) or very sweet (dolce), other wines are almost completely dry (secco). Grignano’s Vin Santo is a brilliant amber color. Distinctive bouquet of dried apricot and nuts with balsamic nuances. Delightful palate and full-bodied with a long finish. A wonderful dessert or meditation wine to be enjoyed with cantucci, amaretti or other kinds of almond-based cookies. The most loosly-packed grape bunches are selected and harvested from the various vineyards, then hung in a well-ventilated room for natural air-drying which lasts approx. 3 months. The dried grapes are then pressed gently and undergo fermentation in small oak barrels. Aged for 5 years in small wooden barrels called caratelli ranging from 50lt to 225lt in size.